If you enjoy this post please consider going to my home page and subscribing to my blog. Since I started watercolor I’ve watched a lot of “instructional” videos to learn to do it better. Many of these are just demonstrations with no real instruction. Some provide a little commentary. Some are badly filmed and it’s really hard to see the details of the work. 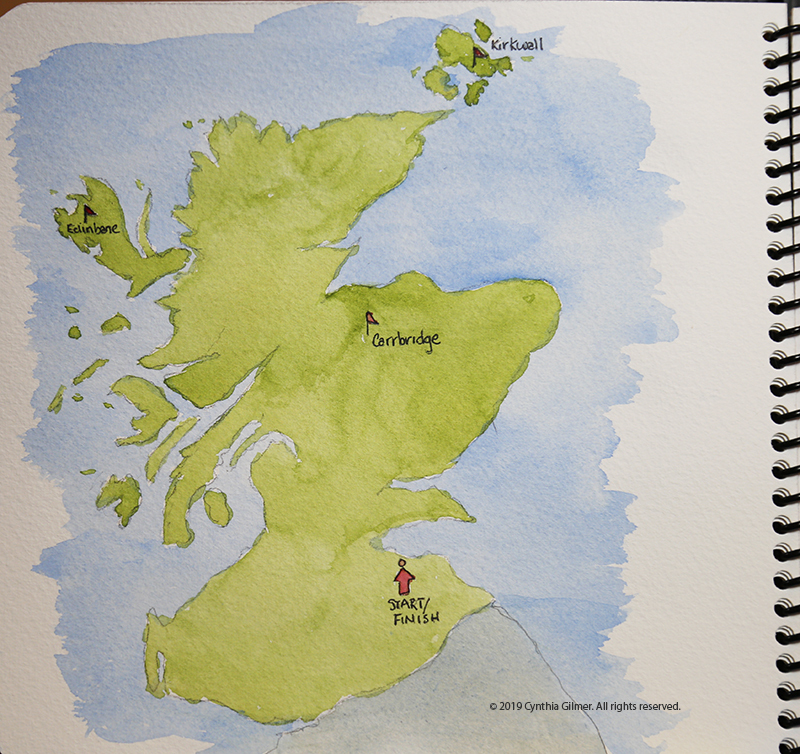 Then there’s Steve Mitchell’s Mind of Watercolor, which is hands down the best online watercolor instruction I’ve found. I found Steve on YouTube a couple of years ago and I was immediately drawn to his spontaneous watercolors. I found his commentary very informative and his corny sense of humor endearing, so I subscribed to his channel and started watching him regularly. Eventually I decided that I was deriving real value from watching his videos and I didn’t think it was fair that I not give back something in return so I became a Patreon subscriber. I have learned so much from watching Steve’s videos that I still consider my monthly subscription fee an excellent investment. The interesting thing is that I always watched his videos and then I’d take what I learned into the studio. This provides useful information but it’s often hard to translate into real transformative learning that will make my art better. 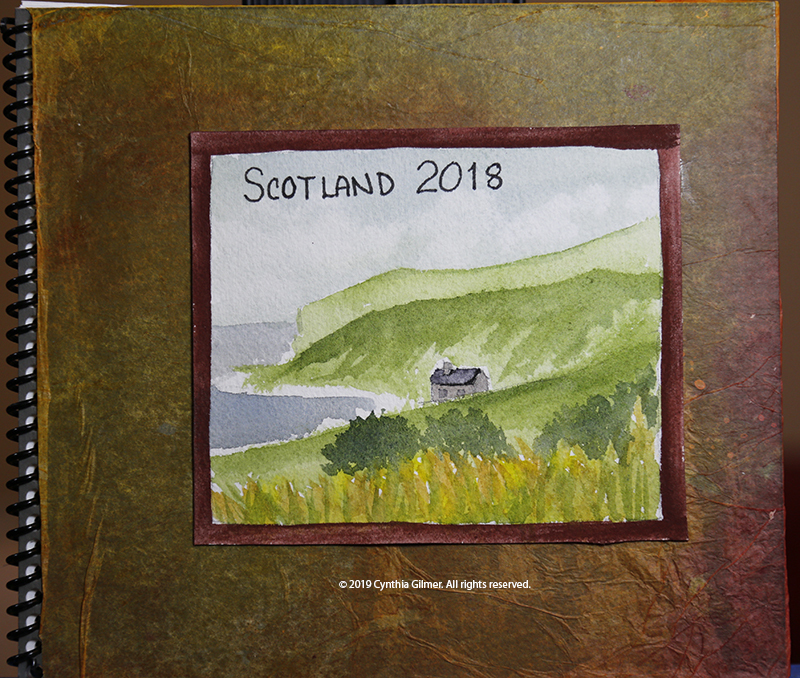 This month I decided to watch in the studio with my sketchbook and palette near at hand, and to paint along. When he gets ahead of me, which he always does, I simply pause the video and catch up. I have to say, I’ve learned so much more doing it this way. I’ve done this with three of Steve’s videos so far. Here is what I feel I’ve accomplished. 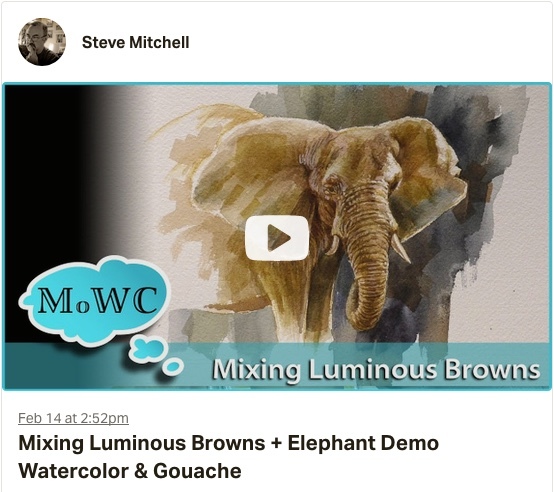 The first video that I painted along with was called “Mixing Luminous Browns + Elephant Demo Watercolor & Gouache”. One of the goals of the video was to learn to mix browns that weren’t just mud. Unfortunately, I didn’t have a lot of the colors he was using, so I improvised with what I had. 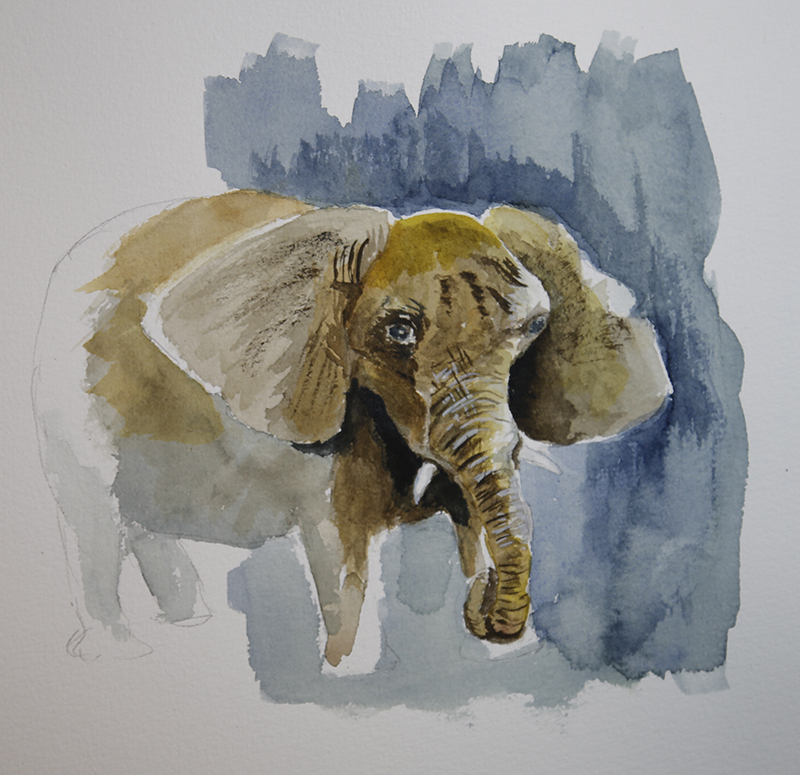 As a result, I don’t know that I learned much about mixing browns, but following along painting the elephant was extremely instructional. The biggest take-aways for me were the use of dark shadow contrasts to frame the lighter areas of the face. I also focused mainly on the head and very front of the animal and just faded out the back. Here is my elephant. 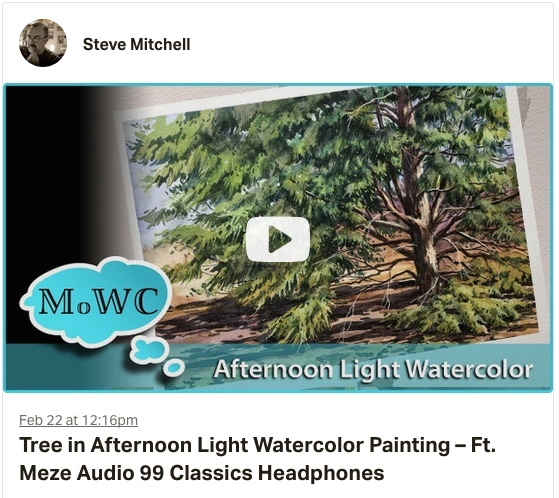 The second video was called “Tree in Afternoon Light Watercolor Painting – Ft. Meze Audio 99 Classics Headphones”. This one was a little unusual because it didn’t include much commentary. Steve has a pretty good YouTube following which makes him of interest to potential sponsors. I don’t think he takes a lot of paid sponsorships, but he does occasionally take free stuff and pays back in kind by giving his endorsement on a video. This was such a case where he had gotten some free headphones and chose to put up a video of him painting with just the music he was listening to. This doesn’t break with his process because he generally just films himself painting and then adds the commentary later. He said that he planned to do a version with commentary. Because this one was minimal commentary, I had to just follow along and watch him paint. Early in the video he showed his reference photo and I was able to capture a screen shot and print that out which was very helpful. What I learned from this video was a lot about seeing light. The process of capturing the afternoon light on the trunk and the variations of green in the pine needles in a series of layers was very enlightening. The result here is not my favorite. I felt that I was unable to effectively capture the feeling of pine fronds…mine are more just blobs of green, but its not terrible and it was a learning experience. 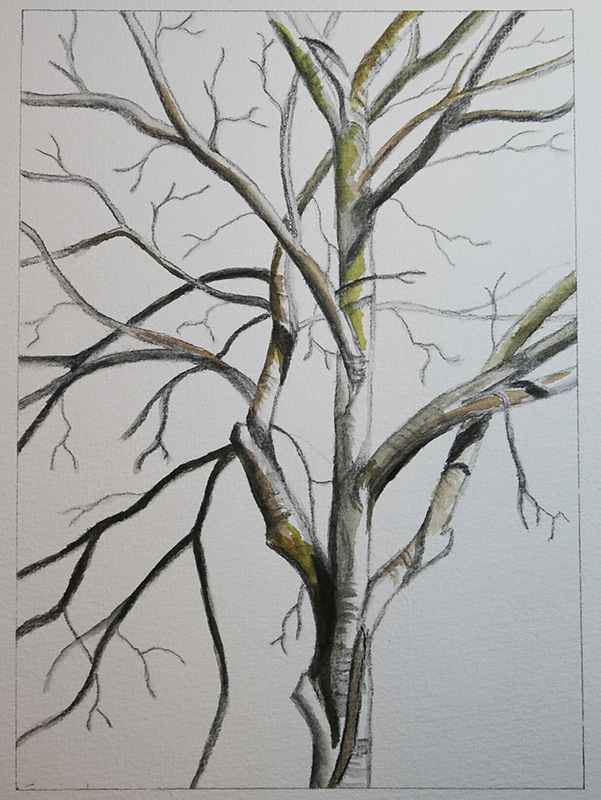 The last one was more of a tree study and was called “Tree Shadows Study & Playtime w/ArtGraf & Water-soluble Graphite”. This one was a lot of fun. 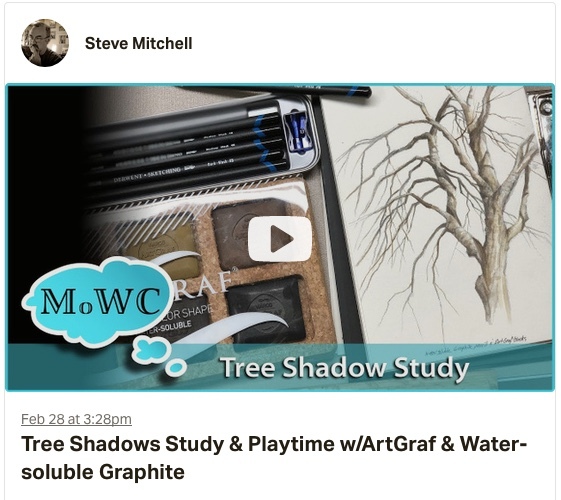 I’m a sucker for trying Steve’s product recommendations, although this video he was reviewing the ArtGraf Water-soluble Graphite, which he ultimately did not recommend. He’d expected something different and said that they really just compared with pan watercolors. Since I didn’t have the product I resorted to my regular watercolor palette when needed and did fine. He did rely heavily on water-soluble graphite pencils, which I had seen in an earlier video and I had purchased some so I was prepared. These are essentially graphite pencils that can be activated into washes with a wet brush just like watercolor pencils. 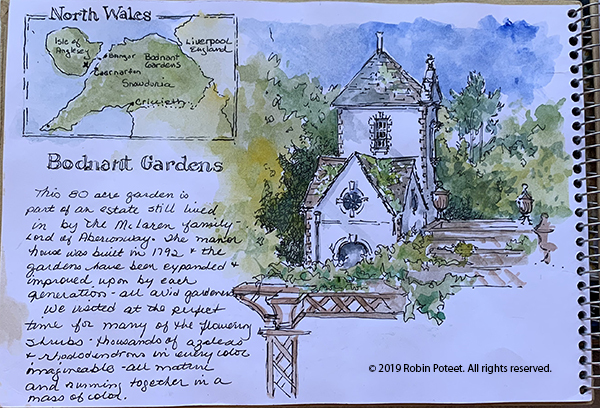 I followed along as Steve did about three iterations of drawing, spending a lot of time capturing the lights and darks, and focusing on structure and depth to make the painting look 3-D and not flat. Finally, in the last iteration we added a hint of color. One thing I felt came from my following along approach in all three videos was to gain some insights of seeing through Steve’s eyes. While I’ve accomplished a lot in mastering the mechanics of painting, I’m still trying to learn to see like an artist and to add my own expression to what I see. I think this last video was the best helping me with this. I’m not sure why…perhaps because it was a relatively simple study so I could focus on that aspect of it. 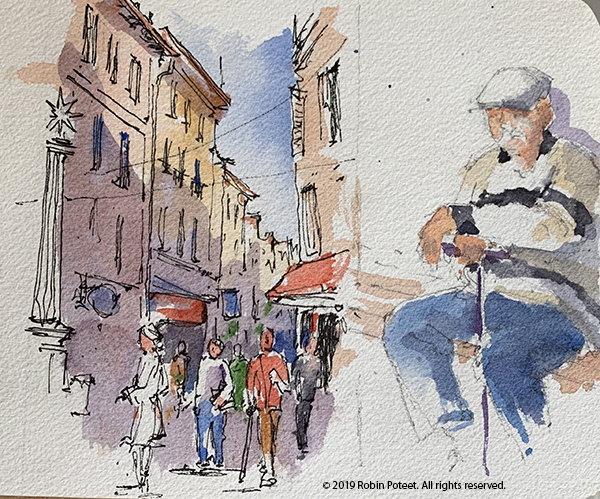 Steve posted his reference photo on Patreon so I was able to look at that and see how he as capturing it, which was also very helpful in translating what he was seeing to what he was painting. Here is my version. One thing I like about the results of this exercise is that I brought my own style to each painting. They are not as good as Steve’s, nor can I expect them to be, but each is uniquely mine. Steve just posted a new video and it is a figure painting, which is going to present much more of a challenge. I’m not good at doing people, but it’s something I need to learn. Now that I’ve joined the Shenandoah Valley Art Center I’ve started watching their class schedule and saw an upcoming one by Peg Sheridan. Her classes fill up quickly so I jumped on it. Peg lives in Staunton and teaches all around the area. 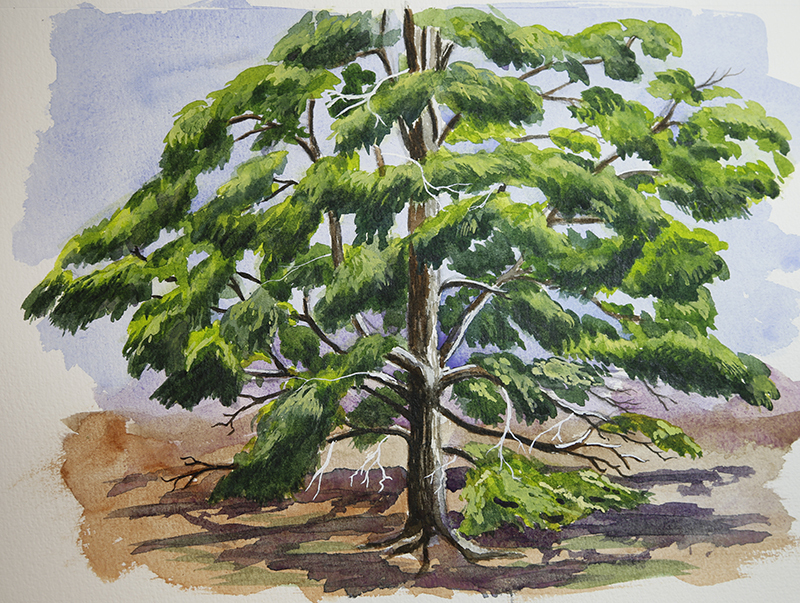 She’s been a watercolorist for forty years! Her teaching style and demonstration skills were great. That said, she made it look so easy it was frustrating. I showed up prepared to be taken out of my comfort zone. I think to some extent that happened. Peg’s initial demonstration was very loose. She reiterated something I’ve been told by multiple other teachers, that you can start light and loose and then slowly construct your painting in layers on top of that. When you start a painting, think about the outcome you’re trying to achieve. What kind of feelings are you trying to evoke? She had a lot of advice on mixing paint that go beyond simply mixing paint on your palette. First, she demonstrated mixing paint on the paper using gravity – put on your washes and then tilt the paper and let things run together. Second, she said it you do mix on the palette, don’t mix completely – just swirl the colors together but make sure you pick up some of each as well as the mix when you put brush to paper. This cuts down on muddy, over mixed colors. Use the side of your brush more – don’t always hold it like a pencil. Again, this is something I do with oils, but less so with watercolor. I need to fix that. Stand more while you’re painting to stay loser. You use your arm more instead of your fingers. I usually stand when working in oil, but sit while working in watercolor. I am going to start to stand more, at least at the beginning of the painting when I want to be looser. If you wet the paper wait till it starts to lose its shine before painting (I knew this but it’s always a test of my patience). Then as it dries, use thicker paint. Stop before it gets too dry because you’ll start getting back-runs. If you over-paint to make your whites pop, use acrylic instead of gouache to get brighter whites. For blotting clouds in the sky, wet the paper towel or tissue. It will pick up more paint. Also for skies, leave the whites of clouds dry but wet the shadows and tap in color. There were some others, but these were some that resonated with me. I did two studies in the class (shown below). Both are small. Peg’s advice was to strive to do several smaller paintings in the class rather than one big one to learn more. The first was a view of a bridge on the golf course near our house. I took the reference photo during the big snowstorm we got in December. The second was of a stream on the same golf course. This reference photo was taken several years ago on a sunny day after a big storm. Peg said she liked the first one but not the second. 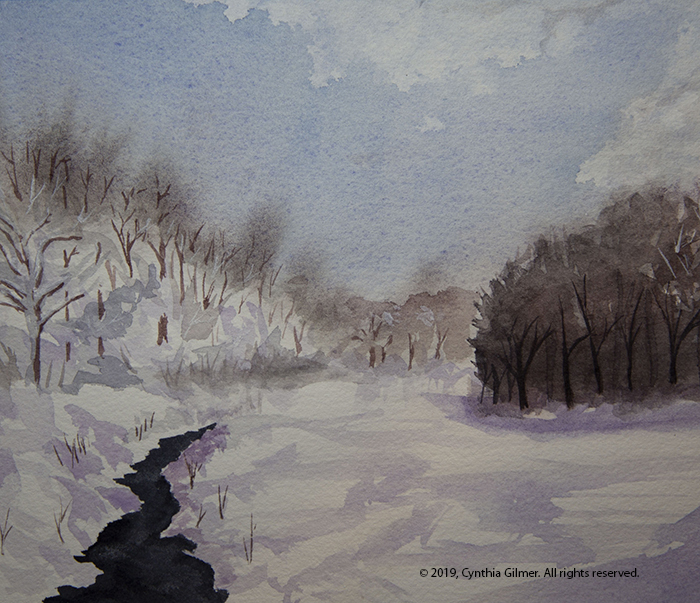 She thought the stream was too dark, and suggested I balance it with darker trees on the right, which I did. It still wasn’t her favorite, but I liked it well enough as a study piece. I felt like doing a small painting. I wanted to do something intricate that I could obsess over the details on a bit. 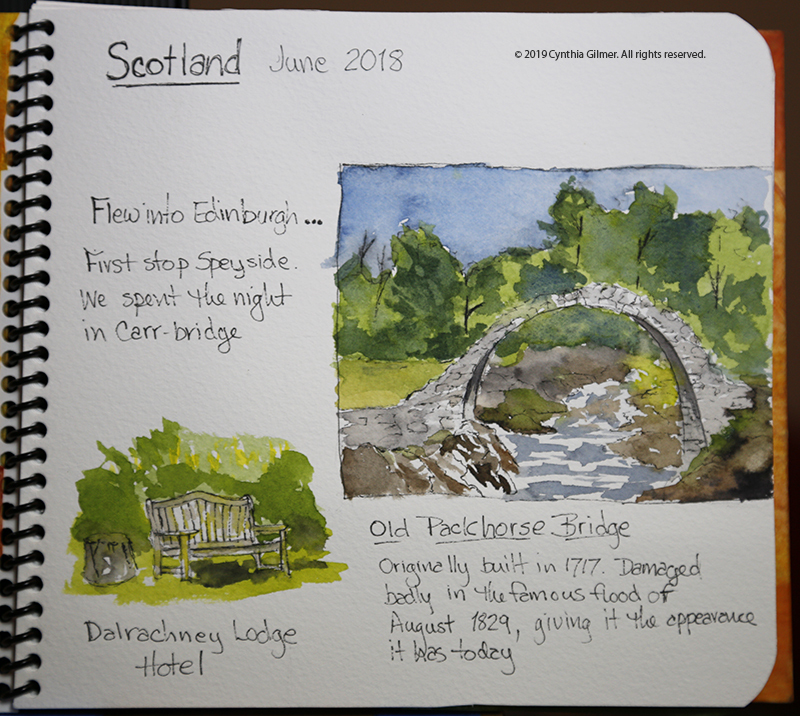 When we were in Scotland, the first place we stayed was a town call Carrbridge. 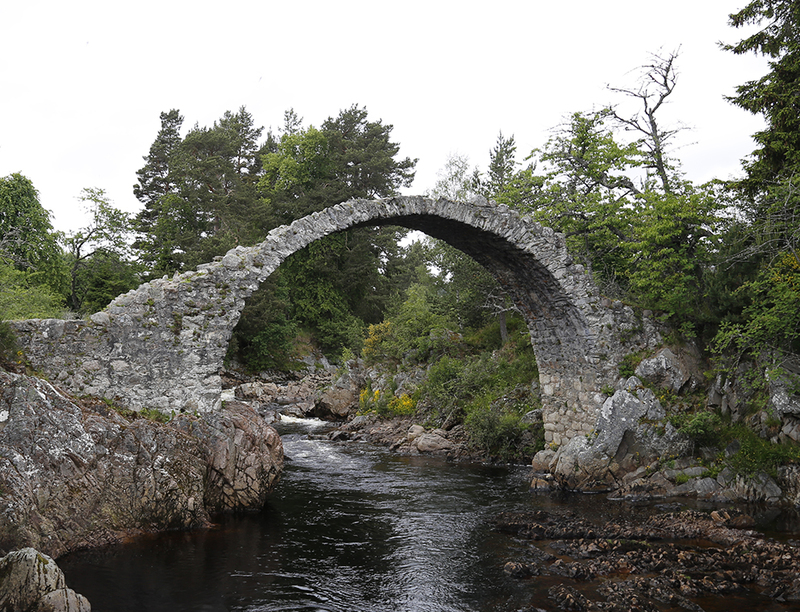 The town is famous for an old stone bridge that crosses the River Dulnian. It’s called the Old Packhorse Bridge. While I was there I did a quick watercolor sketch from a photo I took, but decided it was time to do something more serious. I took a different approach with this one. I tried very hard to use Marc Holmes’ tea-milk-honey approach where you start with a very light sketch and then gradually add more and deeper color in layers. I tend to be impatient, so I start adding too much too soon, but in this painting I was pretty disciplined. I’m also pleased that I left out a few details that I think made the scene less pretty. My engineer’s brain always wants to paint all of the details, including the ugly stuff. After the pencil sketch I put a light layer of foliage in. Then I did the first layer of water. 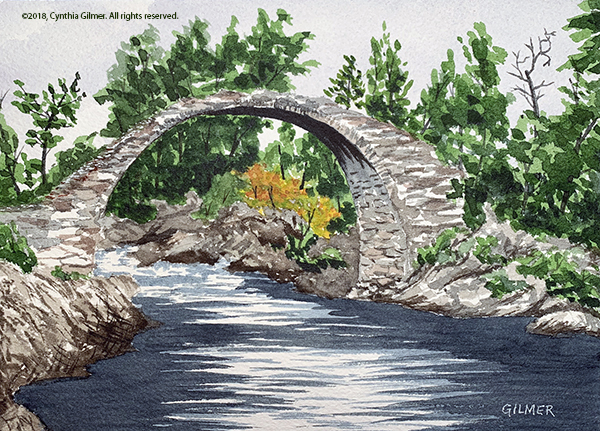 Then I did a light sketch of the rocks and bridge. Then I went back over the whole painting deepening the color and correcting a few things I didn’t like. Finally, I did the tree trunks and branches. I liked the result. Here is the painting. It is 8×6 on arches paper with da Vinci watercolor paints. I spend a lot of time walking in our mountain community, and one of the things that I always find striking is the fire hydrants. Of course fires are a big deal when you live in a forest, so I’m really happy they are there, but in our natural setting, I love the way the red contrasts with the green around it. Red and green are complementary colors, so when you put them side-by-side you get great contrast and the hydrant really pops! I’ve taken a lot of pictures of them but yesterday I tried my hand at painting one. This is a watercolor and it’s approximately 5×7. Sometimes it’s fun to paint small. I’ve also been watching recent videos from my favorite You Tube watercolor artist Steve Mitchell. He’s been demonstrating negative space painting, so I got to practice that as well. 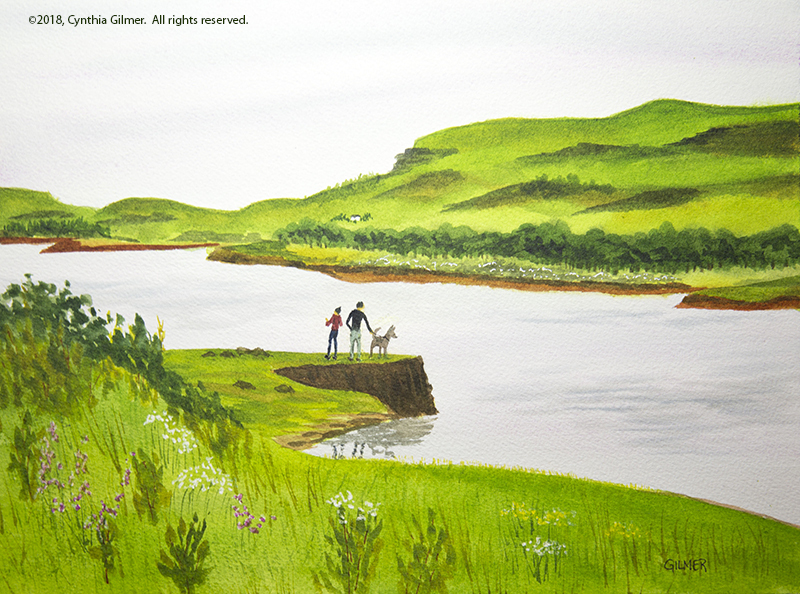 I painted the light colored foreground leaves and did a wash for the grass first. Then I did all of the very dark background shading of the forest around them using negative space painting. Then I painted and detailed the trunks, the rock, and some of the detail in the grass. 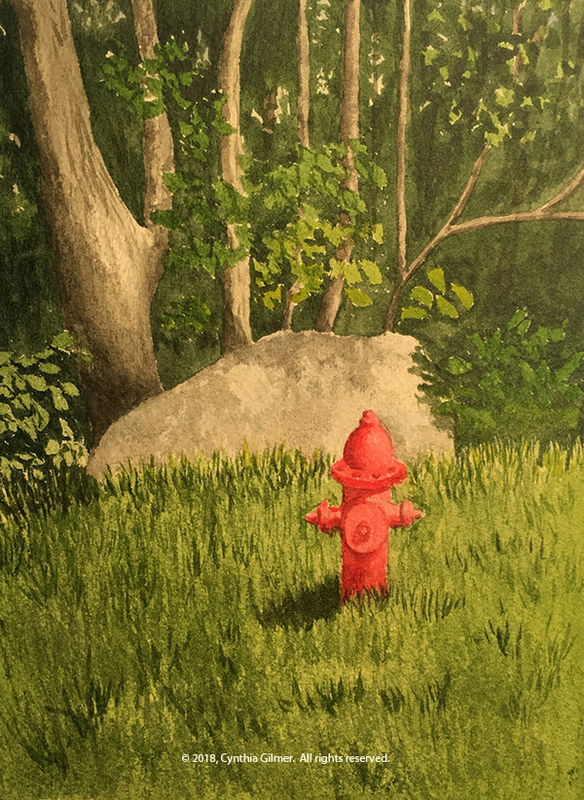 Finally, I painted the hydrant and finished the detail in the grass. I masked the hydrant with tape during the earlier steps just to keep it white so the red would be very bright. Here is the result. It was a lot of fun and I’m happy with the result. Finally, some things are settling down and I’m doing a bit of painting. Before we get to that, I want to let you know that you can now subscribe to my blog. I’m thinking that if those of you who are really interested subscribe I will post less on Facebook and stop annoying those who have no interest in my art journey. So please…if you like this blog, provide your email in the “subscribe” box on the home page and you will receive notifications when I add a new post. I promise I won’t sell your email or post too often. Given that I took a couple of months off to move and did very little painting, I felt pretty rusty when I got back to it. For a while, I felt uninspired and disappointed in the results. I’ve done a few pieces lately that I feel a little better about. I decided that the best way to get my confidence back was to return to a subject that is comfortable to me. 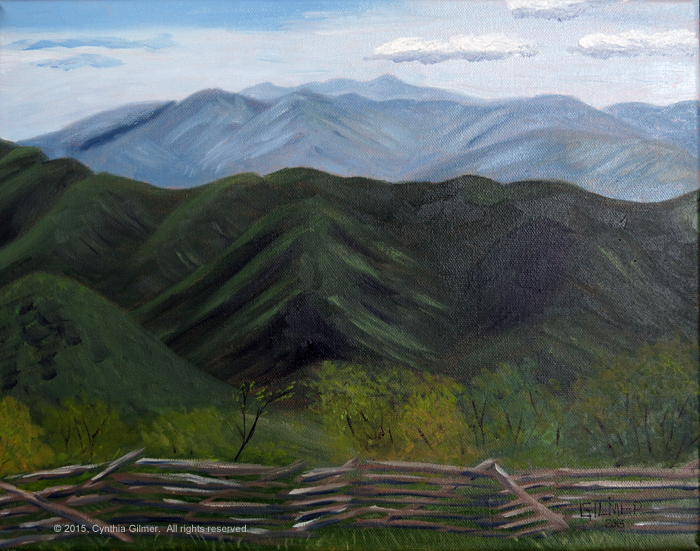 With that in mind, I painted Three Ridges from the overlook. I used a photo I took on a pretty day a few weeks ago. 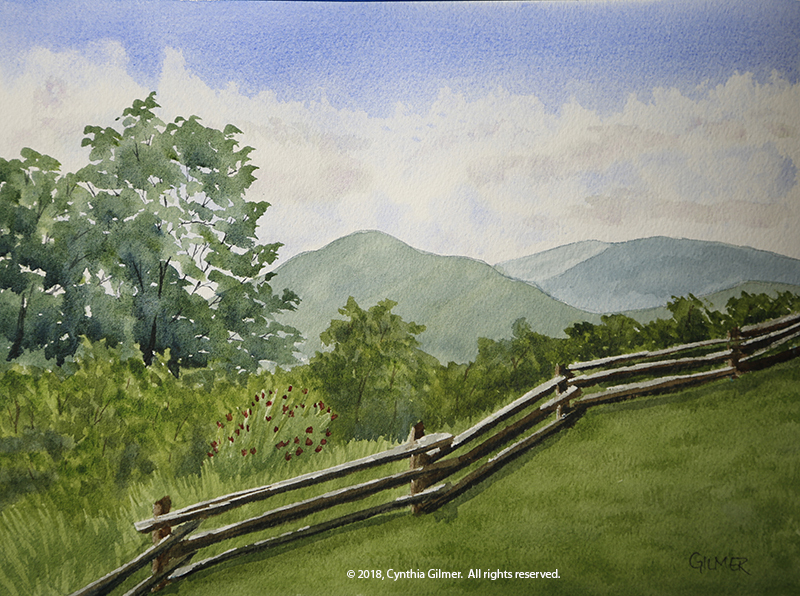 I changed the angle a little from past works to give it a different composition with trees in the foreground on the left and the fence running away from the viewer rather than straight across the scene. There were some pink flowers in the foreground, and if there’s anything I don’t like about this piece it is my attempt at capturing those. In retrospect, I probably should have masked them out so they could be lighter pink, or left them out of the scene altogether. This is 12×9. The other thing I’ve been playing with a lot is wooded scenes. A while back I did an oil painting of a mountain stream in the woods and I really like that painting. We’ve been doing a bit of hiking and I’ve been trying to capture some shots of sunlit wooded paths. 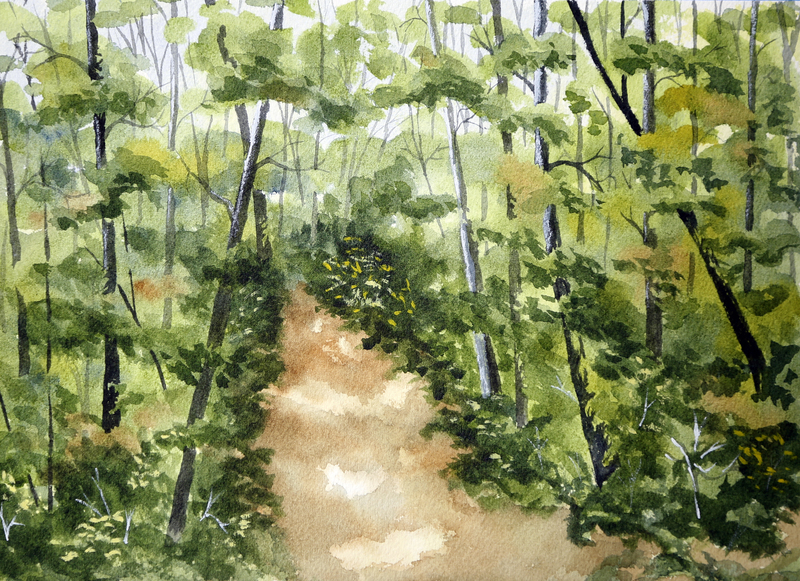 I did this watercolor study from one of those photos on a hike to the White Rock Falls (off the Blue Ridge Parkway). It took a bit to get the path to look right. At first it lacked depth, so I darkened up the foliage on either side and it started to pop. This one is still taped to the board, so I might mess with it a little more. This is also 12×9. I’ve been threatening to get the oils out again, and my experience painting this scene in watercolor inspired me to do an oil version. The last couple of oils I’ve done, I’ve tried to learn from my approach to watercolor to give my paintings a more impressionistic look. I may have taken that a bit too far in this one, but I like the result well enough to say it’s not bad for the first oil painting I’ve done in over a year. (Note that the photo is not the best. It is still very wet and difficult to move somewhere where the light is better.) I tried some new techniques I’ve wanted to try including painting with a palette knife. This painting is a combination of brushwork and palette knife. 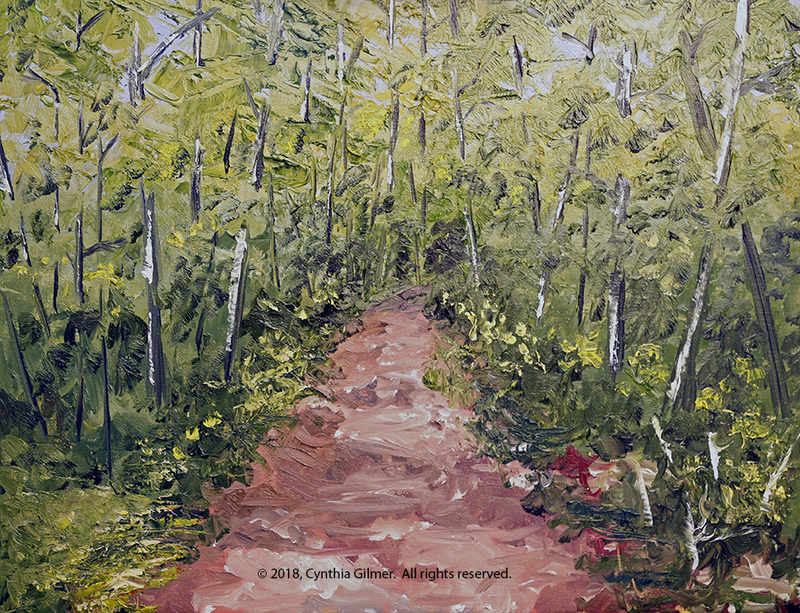 I did the original sky and some of the foliage using the palette knife and then used a brush for more foliage, the path and the tree trunks. Finally, I finished the sunlight on the tree trunks with the edge of the palette knife. I did this quickly, as I would a plein air. I went back to it after a day because I thought there was too much sky showing through the lower trees. I think correcting that was a big improvement. This is 20×16 on canvas. As always, thank you for taking the time to read my musings about my journey. Comments are always welcome. So, my high school reunion was last weekend…more years than I care to admit. It was great to see everyone. The organizing committee did a fundraiser where they asked classmates to donate items that they could sell in a silent auction. They reached out asking if I would donate a painting, and of course I said yes. I donated the small version of my painting of the houses on the isthmus on Tilghman Island. I chose this because I went to high school in Maryland, and I thought that a Maryland Eastern Shore scene would resonate with my classmates. I’m pleased to say that it sold for a good price, and even more pleased (and flattered) that it sold to a fellow artist. Chris Bussler, is the wife of one of my classmates. 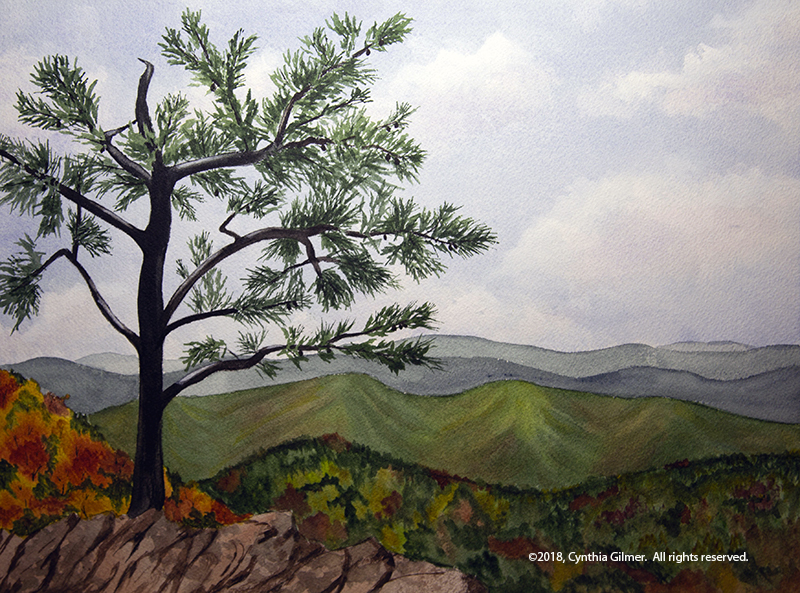 She lives in Tennessee and after a successful career as a Navy Officer she is now a full time artist. She does wonderful work that can be seen on her website. I’m finally settling into my new life being mostly retired, but still much busier than I’d like to be. I am starting to finding some time to paint again. I hope to have some things to post soon.